A typical combustion engine in use. The combustion engine was created by Tim 'The Tool Man' Taylor in 1876, the first version was wooden and each time it was started it would set on fire and only last a few revolutions before the fuel tank exloded and the scientists died. Each time the scientists died, new smarter scientists where imported to continue on the project. 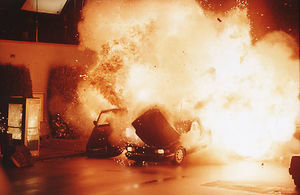 After at least 20 years of explosions one scientist sudgested that they use cast iron for the block and so the combustion engine was invented. This engine lasted a whole 800 revolutions before a piston shot out the block and took off the scientist's head. It only took the deaths of a dozen or more scientists before one suggested that the heads should also be made of cast iron. This innovation was very successfull. The engine ran at 300 rpm for 65 seconds, then the wooden pegs that held the head on blew out and killed the innovative scientest along with a reporter from the National Inquirer who was there researching an article about taxes on imported scientists. This page was last edited on 28 October 2015, at 20:54.